Here we are introducing the new pallet projects, achievements, and latest pallet recycling trends! If you just love to get crafty with old things or with pallets then this list of DIY pallet ideas is going to be something very special to try out at home! These creative pallet ideas speak more for building amazing wall art frames and showpieces out of pallets for free! These ideas guide you better than how to fancy up your interior walls with the rusticity of old wood and functional as well! Here whole the creative DIY pallet projects are to play with those separated pallet slats! Plan the separated pallet slats to install worthy mudroom benches, build the rectangular frames out of pallets slats and decorate them with rustic tree branches and faux flowers to raise them as prettiest wall decors! 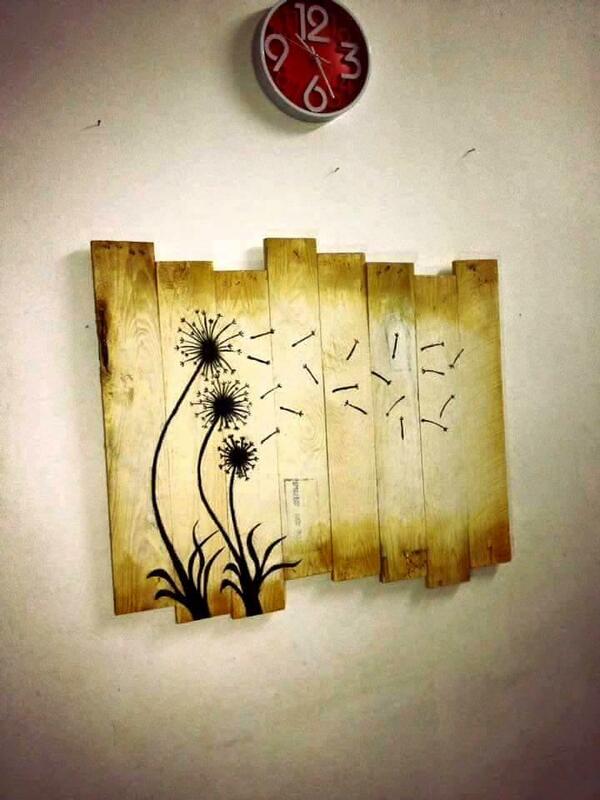 Build some define wooden boards or shapes by putting flat pieces of pallets and just use your own master hands or stencil patterns to paint the amazing visual art over them for fancy wall art frames out of them, a much interesting example is the dandelion flower wall art here! 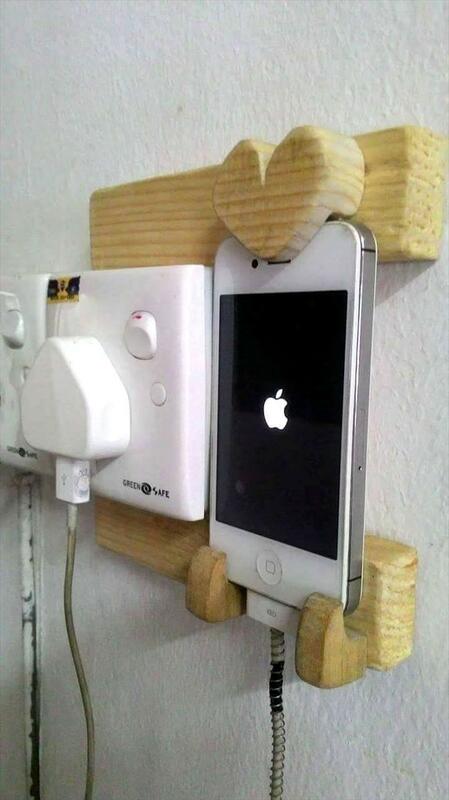 Build the amazing wall organizer out of separated wooden stripes of pallets and also the mobile phone charging station without getting expensive, provide care to your expensive phones while getting charged, explore a creative example listed below! Here this project will let you know the creative details about how you can fancy up any space with pallets along with getting the right furniture for that particular interior space! 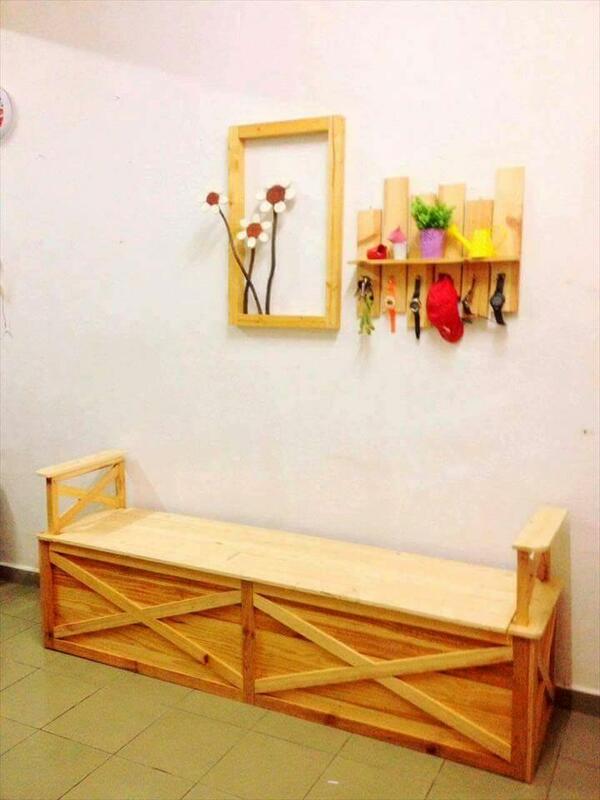 By recycling the old woods and pallets, a mudroom bench, a wooden shelf with hooks and an amazing flower wall art frame has been made using dismantled pallet pieces! 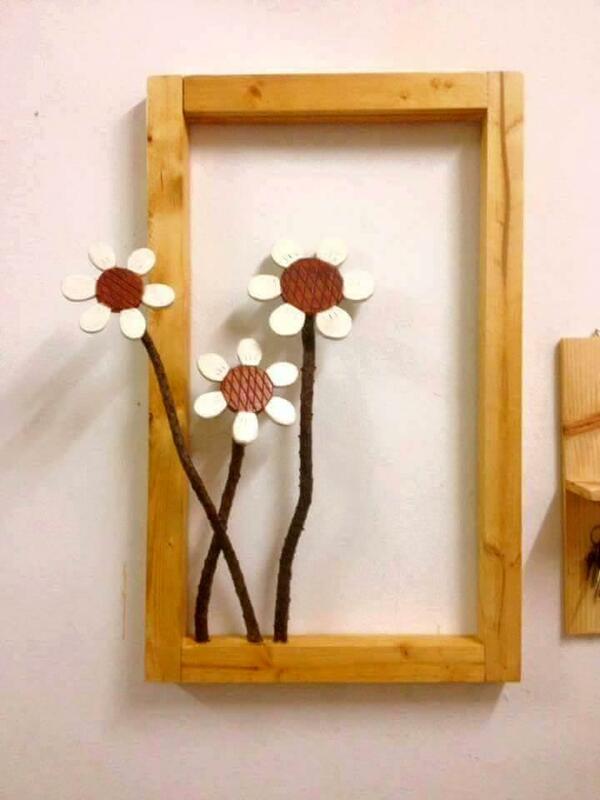 Check out here the detail for this artful addition on wall, wooden frame is composed of thicker pallet lengths and there are rustic tree branches holding the faux flowers at their tops, stand in the frame for a fancy wall art frame out of it! 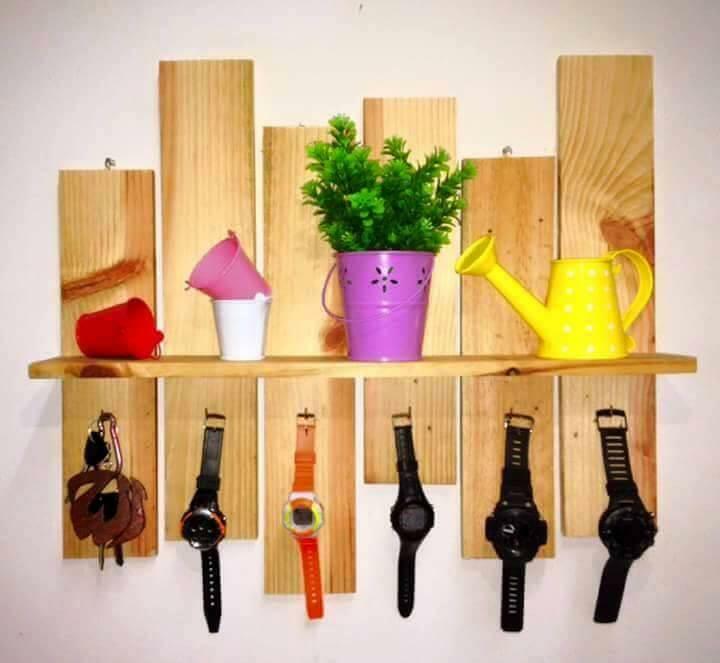 Here is one more highly subtle and functional manifestation of pallet wood slats, perfect display shelf that is having mini hooks fixed to bottom side allow the user to hang his watches and keys in an enchanting manner! 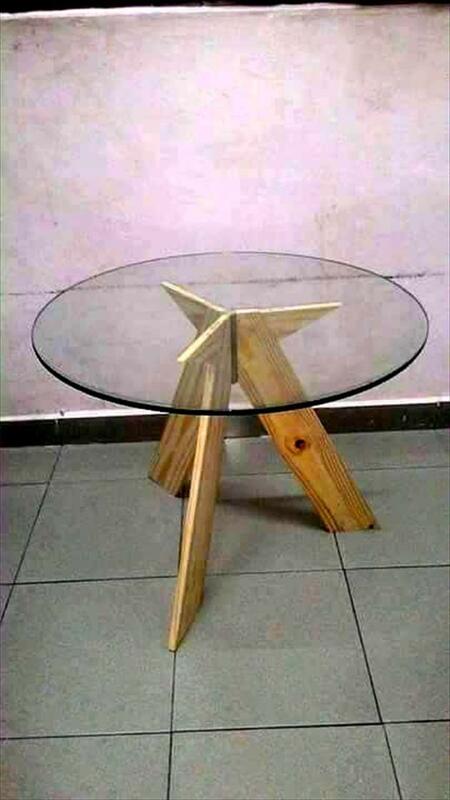 Check out the most creative and finest details here about how you can plan any 3 strong looking pallet slats for building cool 3 legs bases for round tabletops, here 3 leg pallet-made base holds a round glass top over for a stunning coffee table! 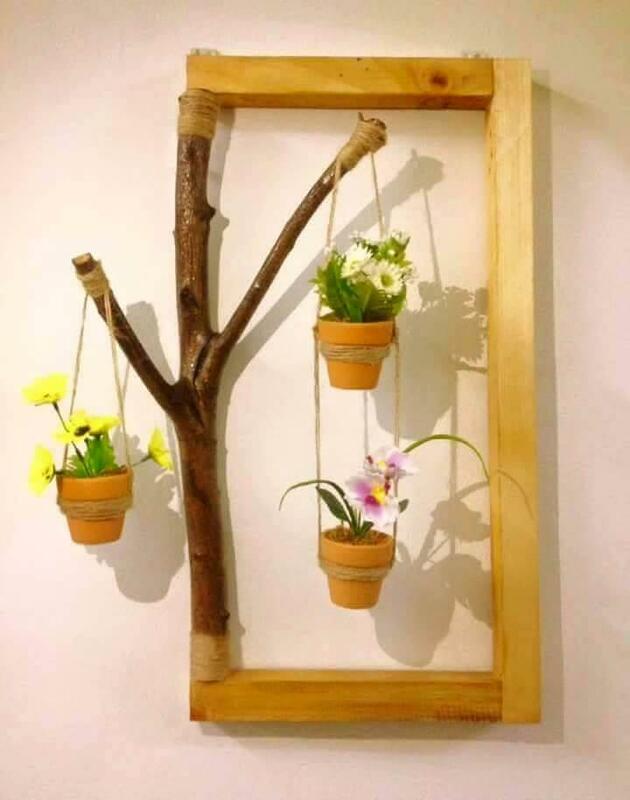 Here is another delicious pallet wall art inspiration, the hanging pot wall art frame, made of straight pallet wood lengths and an old tree branch that has been made a part of the frame and holds three flower pots suspended through twine! Pack the pallet slats for artful wall wooden boards and you can paint anything special over them for stunning wall art pieces, here cool dandelion flowers have been painted using black paint, you can even go with the special stencil patterns for painting cool shapes and precise patterns over pallet-made boards! Reduce the risk of falling your mobile phones, ipads and iPhone’s by using the amazing hand-built pallet charging station, a very new and innovative pallet idea to assist mobile phone lovers!